June 7, 2016 By This post may contain affiliate links. This summer make some unforgettable brownie desserts. This amazingly decadent Brownie S’mores Cheesecake is as tasty as it looks and these Brownie Ice Cream Pops are better than anything you’ll find on an ice cream truck. Oh, man, you are going to love me when you make these two brownie desserts. They are both incredibly decadent treats that look as amazing as they taste. If you’d ask me to choose my favorite of the two desserts, I simply could not do it. 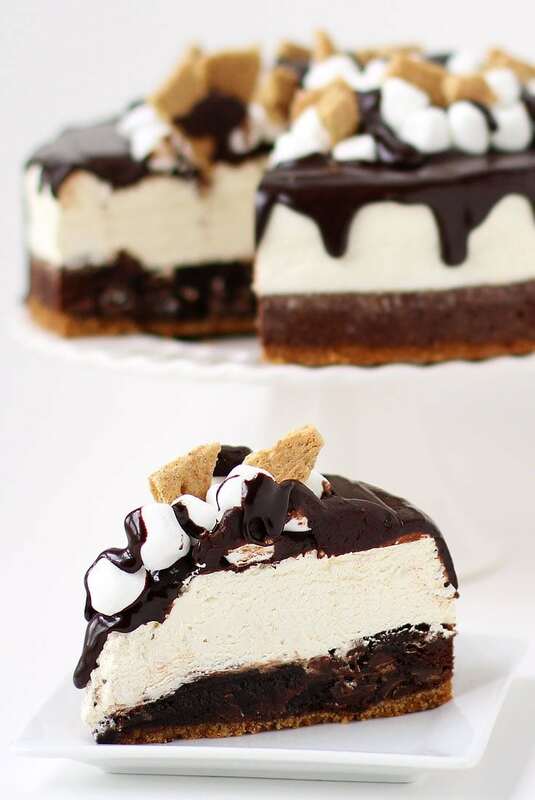 This Brownie S’mores Cheesecake has a crispy graham cracker crust topped with an ooey gooey brownie and a light and fluffy marshmallow cream cheesecake. The dessert is covered in rich dark chocolate ganache, mini marshmallows, and graham cracker bits. It’s definitely the prettiest brownie dessert I’ve ever created. If you are like me and you store it in the freezer, and you pull out a slice for dessert, you may not be able to wait for it to thaw. It’s alright. It’s great frozen. It’s also good cold, straight out of the refrigerator. I even had a slice after it sat out at room temperature for over an hour while I shot pictures, and it was fabulous. It has all the lovely flavors of a s’more in a dressed up dessert. 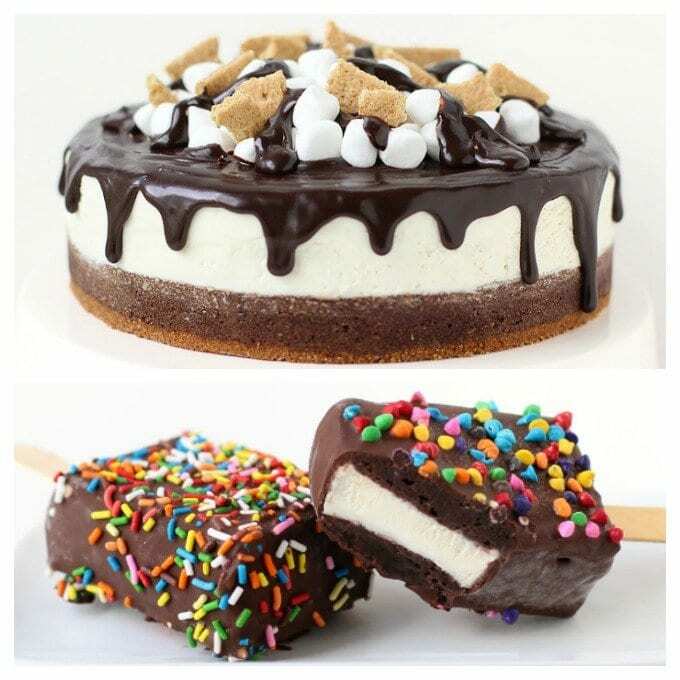 If you prefer something a bit more colorful and fun, give these Brownie Ice Cream Sandwich Pops a try. They are so easy to make and can be decorated using sprinkles, nuts, rainbow chips, and more. 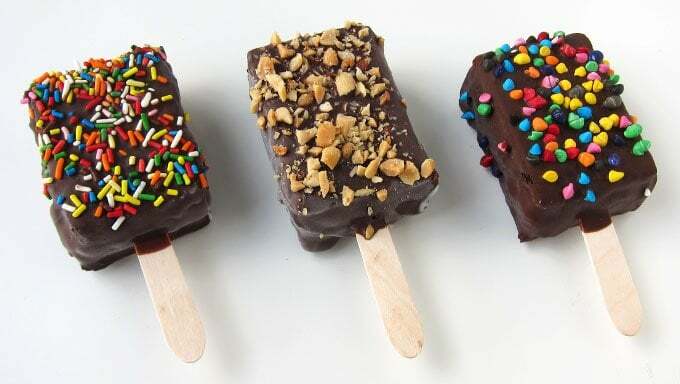 Each pop has vanilla ice cream sandwiched in between two brownies and dipped in a chocolate shell which is made from melted chocolate mixed with coconut oil. If you use virgin coconut oil, your pops will have a distinct coconut flavor, which I loved. But, if you are not a fan of coconut, be sure to use refined coconut oil instead. I used the virgin oil and loved the underlying coconut flavor. It paired so well with the chocolate and vanilla. I particularly liked the pops sprinkled with the rainbow chips. They looked festive and tasted even more chocolatey. Click the links below and you’ll be whisked away to Tablespoon.com to see the recipes and tutorials. Dessert for breakfast sounds great! This cheesecake is soooooooooooooo good. I know your daughter would love this dessert. Both of these desserts are must try recipes! They are sooooooooooo good. Thanks, Karen!